Chris Neiweem – HVAC on Economic Opportunity for hearing on Pending Leg. This bill would provide the needed funding and support to keep VA’s administration of education programs to a standard veterans will require over the next decade. Last week, I appeared before this committee with survey data collected by IAVA members that showed late payments continue to occur with respect to the Post-911 GI Bill benefit program (Chapter 33). This legislation is necessary to continue to improve and modernize the services that VA is currently providing and will move toward preventing these problems from occurring in the future. Broadening electronic automation functionality and enhancing technological capabilities are the only way to make sure the disbursement of education benefit checks keep pace with current technological capabilities. The timeliness of benefit delivery to veterans over the next decade will greatly depend on efficient IT technology platforms. 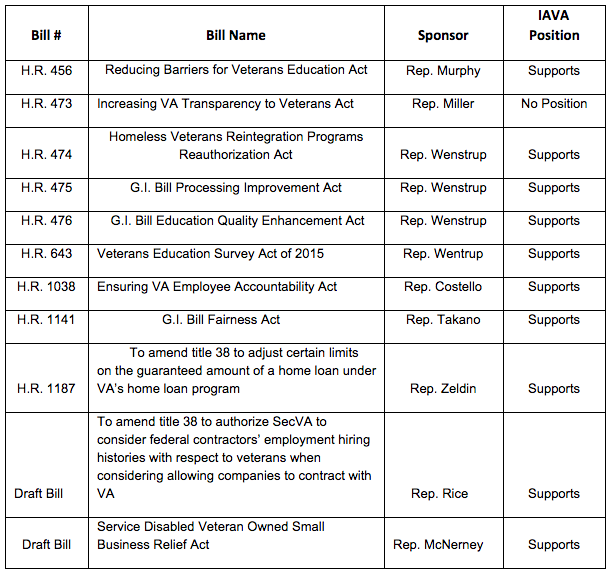 IAVA supports this bill and appreciate the resources it will provide VA to better assist in getting education benefit payments right the first time. This legislation will extend needed housing benefit programs veterans depend on for an additional next five years. Additionally, this bill will make needed changes required to maintain support for veterans currently being served by HUD-VASH vouchers. Allowing veterans access to housing support and job training programs greatly increases his or her chances for success when transitioning to full time work and a long-term residential option. This bill would consider time spent by reserve components healing from injuries in DoD facilities, as good toward P911 GI Bill program eligibility. When reservists who are deployed overseas return stateside and their Title 10 orders expire, his or her time counted towards their eligibility for P911 benefits is not counted. This would fix this inequity. There is no reason that an injury should reduce accrual of education benefits. The chief solution this legislation would provide is capping the payments that are currently being provided to some private flight schools at $20,235.02. In the last several months it has come to our attention that some student veterans have taken flight training and been charged excessive fees that have been paid under their GI bill benefits. This measure provides a common sense cost control for extremely high fees, that upon examination are well above the cost intended for the instruction received. In learning more about some of these scenarios and in working with the committee we agree section 4 is necessary to protect VA education benefits from abuse. This legislation would require a non-government entity to conduct a survey of veterans’ views and experiences utilizing their education benefits. The information that the survey intends to capture is broad and would go a long way to identifying how support programs are working from the view of the customers we care about most—the veteran. Additionally, these surveys would solicit views on TAP participation and potential barriers or obstacles that prevented veterans from making use of their benefits, for those that haven’t participated in VA education benefit programs.The focus on each person’s individual experience ,is the best way to know how our nation’s programs are, or are not helping them in achieving their educational and employment objectives. This accountability measure is of great interest to IAVA and we are continuing to examine how its potential enactment could impact the Department and our members. There is no question accountability failures occurred at the Phoenix VA Medical Center last summer, and that this Committee and MSO/VSO stakeholders must aggressively promote policies that make certain those actions; that included the maintenance of secret waiting lists of veterans waiting for care is never repeated. We support the intent of this bill and look forward to a closer examination of how federal policy across the U.S. government compares with these recommendations for the Department of Veterans Affairs. Additionally, IAVA will engage with the VA to identify how its implementation would impact the employment culture and retention mission at the Department. We appreciate Chairman Miller’s staunch commitment to making sure our veterans are receiving the best care our nation can deliver and will continue to closely study this measure. As such, while we support some of the provisions of this bill, we require more time and study before issuing full support. This bill would adjust the VA home loan guarantee restrictions currently set at 25% of the loan, and allow more flexibility to VA in determining its guarantee commitment. Providing VA flexibility and removing this cap could be the difference that allows a veteran to purchase the home they have always envisioned. Veterans are often in a position financially to take on and manage mortgage payments but in some areas of the country where the median cost of a home is slightly higher encounter difficulty securing a loan. The standards and criteria for securing a loan are still the same between the lender and veteran but this change would promote the removal of that initial barrier to get the deal off the ground by increasing VA’s guarantee commitment. This bipartisan measure can go a long way toward supporting the prosperity of many veteran home buyers. Thank you for your time and attention, I am happy to answer any questions you may have. As Legislative Associate, Christopher maintains Congressional relationships and supports advocacy programs. Chris spent 6 years in the U.S. Army Reserve as a military police NCO and served a tour of duty in 2003 during Operation Iraqi Freedom detaining Enemy Prisoners of War (EPWs), and performing base security and customs in during the Iraq war. 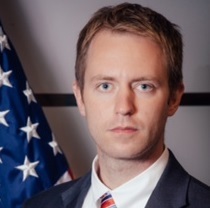 He completed a Bachelors Degree in political science from Northern Illinois University in 2007 and completed a Masters Degree in 2011 from the University of Illinois at Springfield in political affairs. Neither Mr. Neiweem, nor the organization he represents, Iraq and Afghanistan Veterans of America, has received federal grant or contract funds relevant to the subject matter of this testimony during the current or past two fiscal years.